Hello dear friends! It's been a while - I haven't posted since May. YIKES! - I have been moved to a different level for next year. I was teaching the "high" level in our program, and now I'll be teaching the "low" level. Very different but I'm excited and have been pinning a lot of great ideas! - I will also be teaching Fine Arts in our special education program next year.! I'm quite exciting for that - bring on the music and crafts!! - We got our school iPads! I've been having fun exploring and am excited for our students to get them as well. 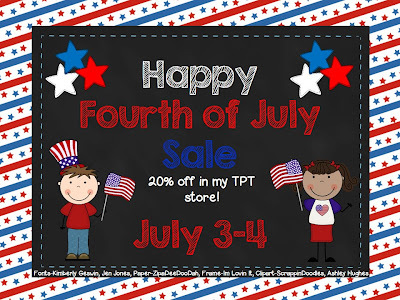 Also, I decided to join some other bloggers and have a TPT sale. Everything is 20% today and July 4th, so go check it out! Head over to Flying into First Grade for a list of other TPT stores who are having sales today too!